The depth perception issues do seem to be a common part of the Red course. Same with the second hole, a dogleg par 5 with a lake in front of the tee shot and hazard / lost ball terrain on both sides of the fairway. Usually on holes like that, a lake in front of the tee shot is either for prettiness or to gulp topped tee shots that don’t deserve to get to the fairway. In this case, that lake did both because it was pretty, but we also needed a lot more carry than we expected. Mike’s tee shot looked perfect off the tee and did end up perfect, but it only barely carried the water. Besides the depth perception issue, the other thing that popped out right away was the unique design of the greens, which means it’s time to talk about Coore-Crenshaw (CC). Remember when I talked about how distinct Pete Dye designed courses are? I’ll claim that CC courses are similar in that regard, but in a very different way. 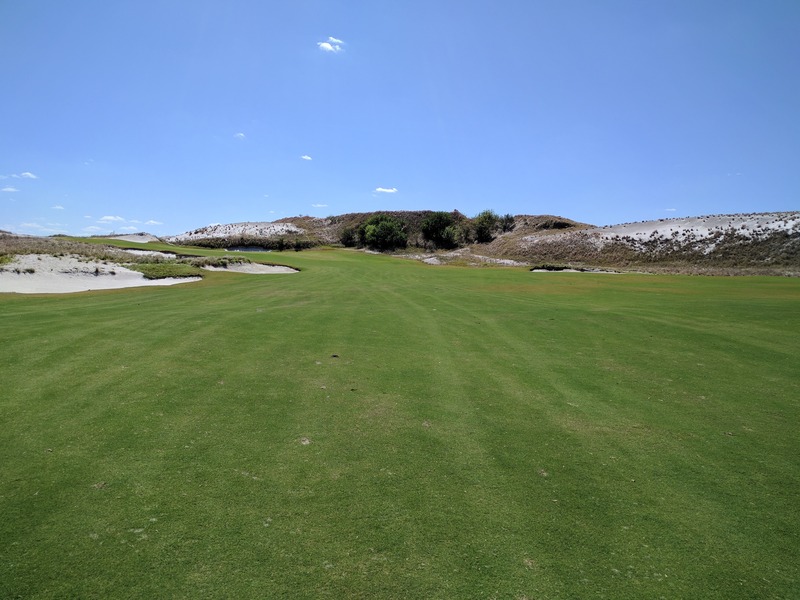 I’ve been lucky enough to play a few of the CC courses in the past, starting with Bandon Trails during the Pub Links in ’11, then the 13 holes of Sand Valley that were open last summer, Trinity Forest in Dallas just past this last Christmas, and then here at Streamsong. I am a big fan of their courses. They’re part of a group of a few modern architects who understand classic golf course design, but create types of courses that haven’t existed before. 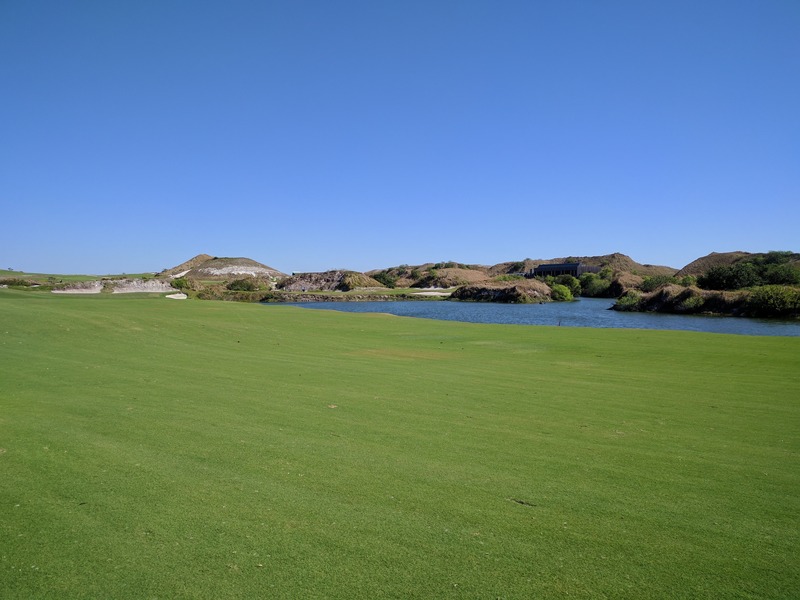 When you play one of their courses, you’ll be in awe of how different the holes are compared to courses you usually play. It’s the design features, not the terrain, that makes their courses unique. CC courses are different, fantastically made, and when you play any of them, you’ll have a mental state where you feel that you’re in a different universe, and will enjoy walking around and being an explorer of the new land. We’re getting philosophical here. Anyway, after only playing the Red course one time, I can remember every hole distinctly, which is the number one requirement for me to consider a course a great one. In this case, compared to Bandon Trails or Sand Valley, there’s not much elevation change on this land. Creating a course with memorable holes on that type of land is even more impressive. The first 6 holes loop around and come back to the clubhouse, and since the loop is counter-clockwise, you’ll see more than a few doglegs to the right — 2nd, 3rd, and 5th holes. … where it’s decently uphill until the green starts, and then downhill to the right side of the green. Classic design penalty for playing it safe, but not hitting the green. This is the approach at the 5th hole, a long par 4 dogleg right with a lake on the left side of the fairway, and a mound with long fescue-esque grass on the right side which is where I yanked my drive and lost the ball. Also, check out the 6th green to the right of the pic, and the clubhouse in the background. Speaking of the par 3 6th, below is the view from the tee. Because Mike teed off first and yanked one left and lost it, I got scared of doing the same thing and dumped it in that bunker on the right. Luckily I hit a good bunker shot and made a 4 footer for par. After the 6th hole, the course shoots outwards. Number 7 is a par 5 with enough room to hammer your drive as far as you can and only end up with an 8 iron into the green as your second shot. It reminded me of the 10th hole at Sand Valley. Again, it’s a tough green and if you’re on the wrong side or the pin is in a hidden spot, you’re not going to be able to get up and down from close. The 8th hole, a short par 3 shown below, is also a hole with a green large enough to make certain pin locations really difficult to hit it close. Check out the pin below, right over a bunker on a green that has no depth in that area, and slopes front to back. There’s also a large back right part of the green. Even though I claim that it’s “really difficult to hit it close” to that pin, Mike managed to stuff it to 3 feet and made a deuce on the hole. The 9th hole is a driveable par 4 where the green slopes front to back, meaning a tough second shot no matter where you hit the drive. 10 and 11 are par 4s with enough room to hammer drives, again, while making sure you avoid the fairway bunkers that are plunked in the middle of the fairway, something that definitely is a CC design feature (see 18 at Sand Valley if you really want actual fairway bunkers). The very distinct 12th is a super long 500 yard double dogleg par 4 that’s really beautiful except for the fact that I lost another ball off the tee and was probably so annoyed because of that snappy hook that I didn’t take a picture of that hole. Incidentally, since it was into the wind, Mike considers it a shortish par 5 because he hit his second shot into a bunker that was 50 yards short of the green. The 13th hole is a par 5 with an enormous fairway. I hit a cruddy drive and a cruddy second shot, but they both somehow remained in play and I was able to make par. 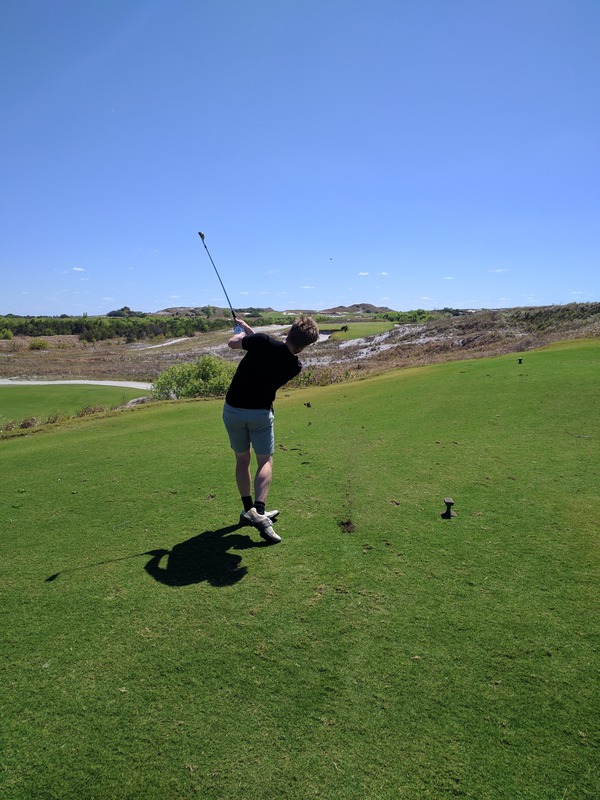 The 14th hole is a par 3 – see my tee shot below. It’s a pretty standard hole with bunkers surrounding the green which is where I hit the tee shot, but got a sandy cause I seem to get up and down from every bunker I hit it into. I need to keep my head down at impact, lot better ball flights when I do. The 15th hole below is an uphill par 4. There’s a giant deep bunker just to left of the fairway that can cost you a shot. There’s more room on the right, but if you hit it too far to the right, you’ll have a longer and more awkward shot into the green. This setup is a very common golf course design feature across many designers. 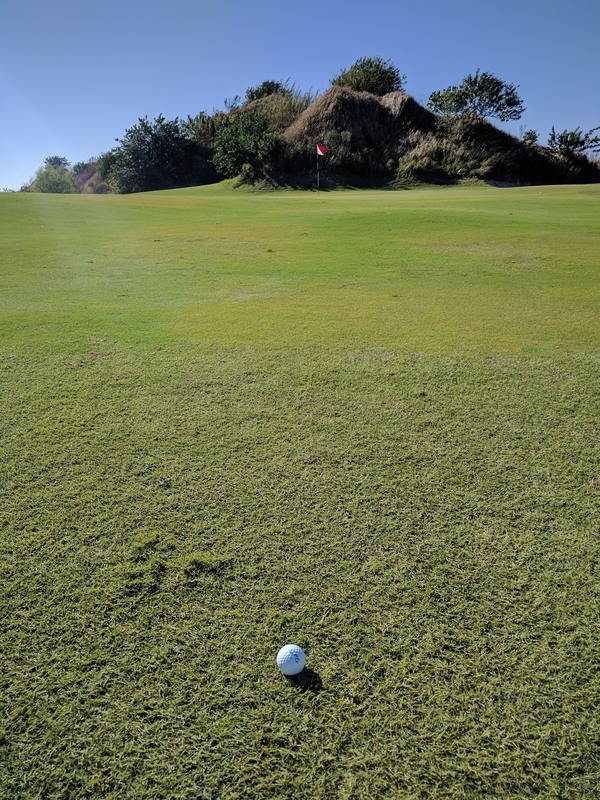 For some reason, the picture I took of this hole is slanted, so make sure to tilt your head to the right to check out the look of the drive. 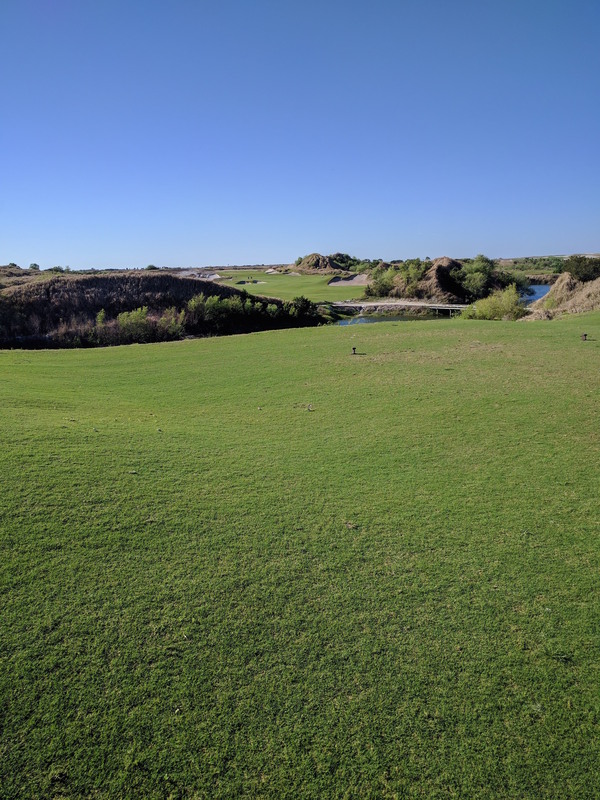 And then we get to 16, which I’ll call the signature hole not just because it’s the hole shown on Streamsong’s website when you click on the link to get info of the Red course. It’s a par 3 over the water with an augmented biarritz green that’s over 70 yards long with a giant dip in the middle. It’s a super remarkable par 3 when compared to all other par 3s, and also a new design feature when designers want to get creative on template holes. Now the only thing about CC designs that I’m slightly down on is their once-in-a-while-too-crazy green where the penalty for hitting the wrong part of the green is too large. 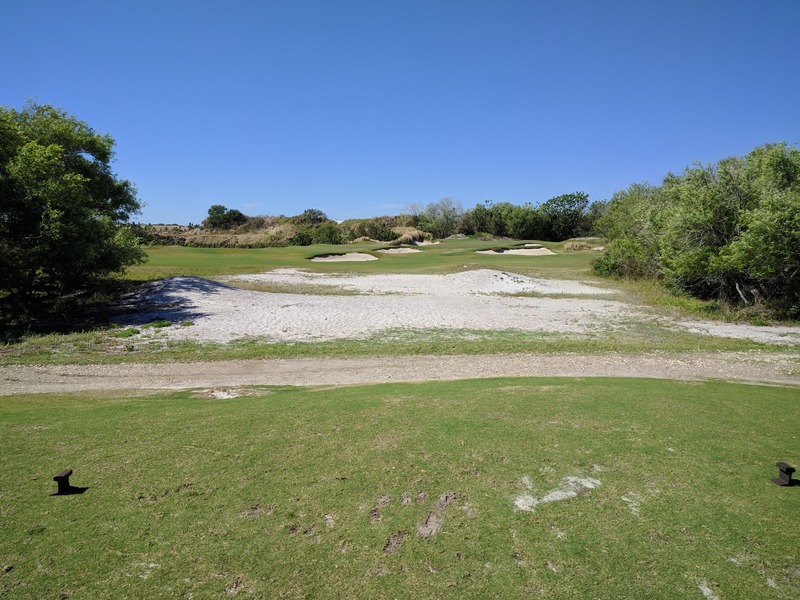 Besides this hole, the 8th hole at Trinity Forest comes to mind which is a par 3 over a canyon that has a green with two levels of two very different altitudes. 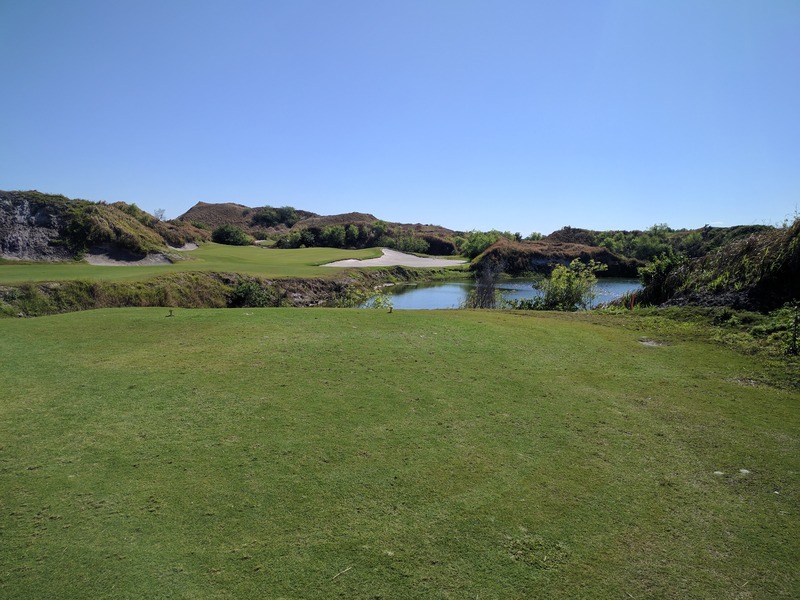 On the day we played, the 16th hole at Streamsong Red had the pin way back, causing the hole to be 225 yards. That being said, the reason I might be iffy on this hole is because I sliced my 4 iron into the shrubs to the right and lost the ball, while Mike hit a beautiful baby 3 wood to 15 feet. Maybe jealousy because I play these holes like garbage, or maybe because I do think they’re too quirky. Back to all positivity. 17 and 18 on the Red course go out and back from and to the clubhouse, with 18 being an uphill hole with tons of white sand. 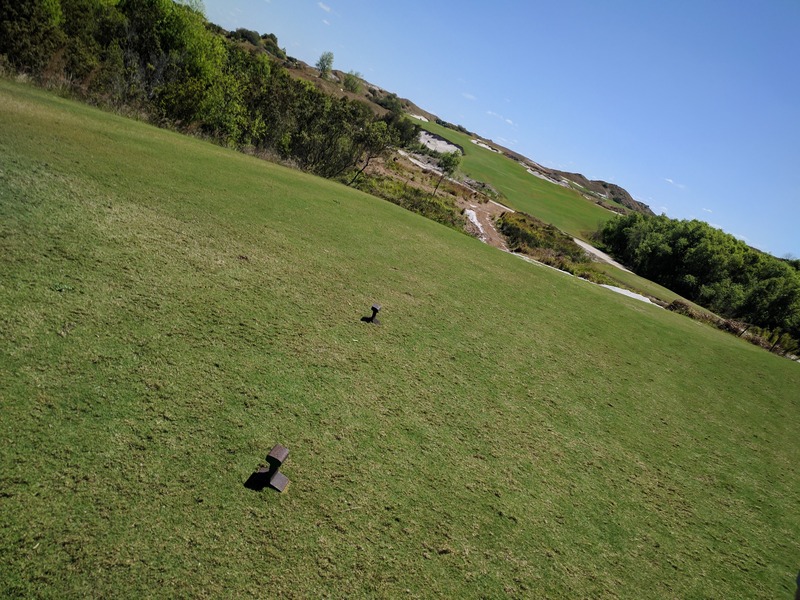 As with all doglegs, a more aggressive tee shot over the difficult bunker will result in a shorter second shot, but…. you know how these holes work. See hole 15 (above) for further explanation. They’re classic doglegs, but with a modern look. That morning, we finished the round in a little over four hours. For a walking foursome at a new-to-us course, it really had great pace. I can’t actually remember if we ever had to wait to hit shots until may be the second shot into 18, which is exceptionally fantastic. My swing was garbage and I missed in both directions. 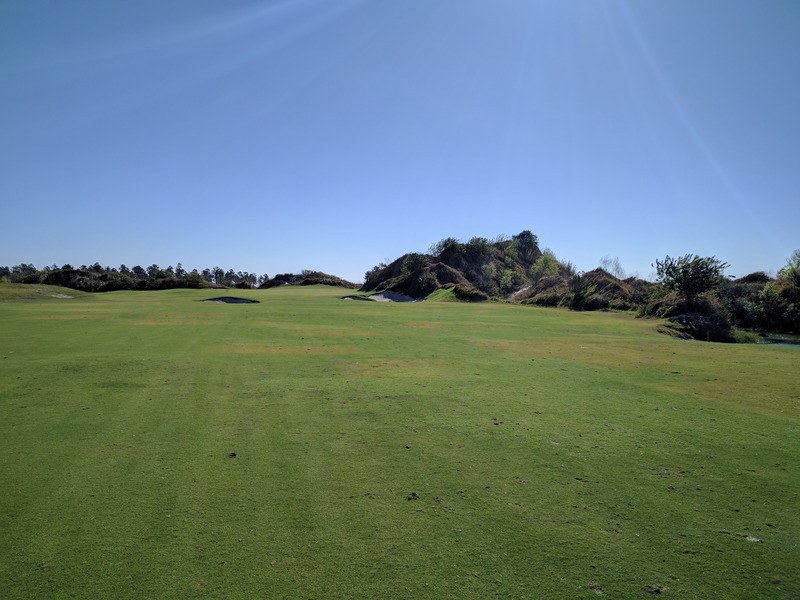 The course is incredibly unique. There are a few types of holes that I’ve seen at courses before, but the great majority are different. Large, sloping, and randomly shaped greens are a huge part of that, but the design of the holes themselves is also beckoning me to come back. I now know what the holes look like and where to hit it if I’m looking to score well. This is the most common feature of modern course designers, especially CC. Instead of courses like the old country clubs that you’ll usually find hosting US Opens (e.g. Winged Food), these new courses are built in a way that makes you think about where to hit every single tee shot. Remember how I talked about all the dogleg holes where the angle you have for your second shot makes a big difference? That’s what all of these modern courses are like, especially Streamsong Red. Since I love torching hot weather, maybe summer is the time to return. That’s it for the Red course. When I post my review of the Blue, I’ll link it here, and then talk about the similarities and differences between the courses. For now though, go back to thinking about how long spring is going to last, and how great summer is going to be to play golf.